Ever listen to a CD by musicians who were not on your radar screen and find yourself entranced by its charm? 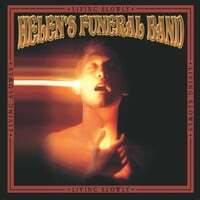 The entire recording by an unusually named group; Helen’s Funeral Band feels like a caress. Combine the silky voiced sounds reminiscent of Aaron Neville, the keyboard of Van Morrison and the tonings of Bobby McFerrin and Living Slowly is what you get. Michael Slattery’s classically trained voice is such a surprise on a pop-jazz-bluesy-funky release, and when combined with multi-instrumentalist Alex Brofsky’s gifts, it is genre crossing delight. Not only are they superb musicians, but carry poets’ souls as they have penned a host of heart rending songs. The Deep Water referenced in the third piece sounds like the journey our hearts take above, within and then below the surface of love. Is it the end of love? And what did she say and how do I feel did she go did she make a scene? Evergreen seems to be an ode to the tender care relationships require. The Joni Mitchell classic Both Sides Now is re-imagined as the closing song. “The band was born after my wife Helene’s mother’s (Helen) funeral. It was the first time that Michael and I had performed live together. A year later we put a few songs together and needed a name, “Helen’s Funeral Band” rang true to us, and here we are. About four years ago I was in a tough place; I had just lost my (plan B/not music) job and was drinking too much. I had sent Michael an email with an instrumental of “Coming Home”. I didn’t want to speak to anyone, but Michael called to say how much he loved the song and was already writing lyrics to it. That was the beginning of this project and also the start of my getting my life back together, and getting back to plan A. “Today” and “Living Slowly” are songs I did years ago with a rhyme and horn melody, respectively, where the verse lyrics are now. Helene and Michael wrote the verses for “Today”, the verse in “Living Slowly” was all Michael. I wrote the lyrics to both hooks. The rest of the songs were a collaboration. I would put music down, and then Michael would expand on it with lyrics, and his beautiful interpretations of the music. “Deep Water” was inspired by an Ernest Hemingway short story “The End of Something”, always a favorite of mine. “Lullaby” was written to as a gift to our cousin Sara when she was beyond weary waiting to bring her daughter Vanessa (and Michael’s goddaughter) home. Fate gifted us back on this one as our first performance of “Lullaby” was the same day Sara brought Vanessa home to NYC, which also happened to be Michael’s birthday. “Both Sides Now” is a great Joni Mitchell song that Michael has performed solo playing the Squeeze Box, I added the arrangement on the recorded version. The album is a very organic project – several of our family members were involved, all of them great musicians. My sister Natasha Brofsky-Tapping wrote the intro melody on “Living Slowly” and her daughter (my niece) Cordelia sings it. My brother-in-law Roger Tapping (who recently joined the Juilliard String Quartet) plays Viola on “Deep Water” with Natasha playing cello. The two of them did the string arrangement for that song. Michael and Helene’s cousin Kate Murphy, a country singer in Nashville, sings on the outro of “Living Slowly.” The great drummer Abe Fogle (of Rob Thomas and my own AB+ band) plays drums on “Deep Water,” “Longing,” “Living Slowly,” and “Coming Home.” The solid and surprising Konrad Adderley (Sonny Rollins, Aretha Franklin, AB+) plays bass on the same songs. Since graduating from Juilliard, Michael Slattery has enjoyed an exciting international career. He has worked with the New York Philharmonic, the Philadelphia Orchestra, the Los Angeles Philharmonic, Lincoln Center’s Mostly Mozart Festival, the French National Orchestra in Paris, the Akademie für Alte Musik in Berlin, and the Orchestra of St. Luke’s at Carnegie Hall. Career highlights include The Very Best of Lerner & Loewe with the NY Pops at Carnegie Hall, Bach’s B Minor Mass with Ivan Fischer and the National Symphony Orchestra at the Kennedy Center, the Tristan Project with the LA Phil at Lincoln Center, the title role in Bernstein’s Candide at Royal Festival Hall in London, and Monteverdi’s L’Orfeo at the Châtelet Theater in Paris, the Staatsoper in Berlin, and at Glimmerglass. He was recently included in The Spectator’s list of tenor “Heroes of the Concert Hall” and his “Dowland in Dublin” CD was chosen for “Opera News” Best of 2012 list. Alex Brofsky is a New York-based Composer/Arranger/Performer/Producer. He has performed and recorded with some of the greatest names in jazz including Miles Davis, Lenny Kravitz, Gil Evans, Quincy Jones, Sonny Rollins, Michael Brecker, Woody Herman, McCoy Tyner, Jim Hall, Dave Holland and many others. He has done remixes for Da’ Brat and Mary J. Blige. Alex has released several CDs on NewBreed records and two solo CDs (“AB+ – the Unentitled” and “Absolution”), both available on Itunes and cdbaby. Mp3.com listed AB+ as one of the top ten artists of the new millennium after several of his song hit #1 on their charts. In addition to “Helen’s Funeral Band” he is preparing a release for the U.K. label “Adaptation Music” in 2013.